My Ninja Master Prep is my best friend. After first testing the Ninja I don’t know why other smoothie blenders aren’t built like this. I make smoothies, frozen drinks, chop onions with complete ease with the multi-blade system. But, a really pleasing aspect is the ability to make baby food for my son. It is simple to blend down fruit and vegetables in literally 10 seconds. Whether it is making smoothies, or baby food, in my opinion the Ninja Master Prep is one appliance that does everything. Plus, it cleans great and just needs placing in the dishwasher. I am really thinking about investing in another one as a backup in case the unfortunate happens and this one stops working. 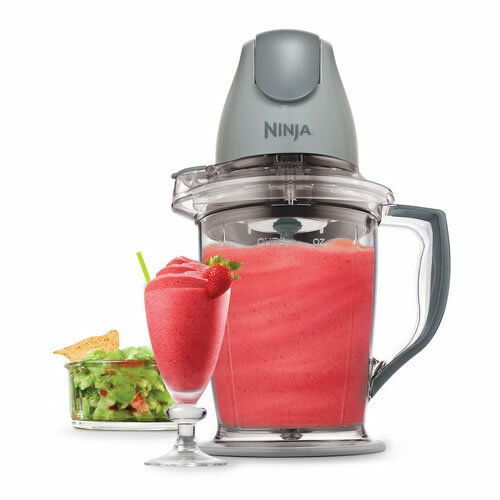 I regularly use the Ninja Master Prep Blender to make green smoothies with vegetables, fruit (often frozen bananas and berries) and ice, and this appliance makes light work of whipping everything until a frothy, smooth liquid is created. I like to extend the time in the blender to make a smoothie with a frothy like consistency because this often reminds me of a milkshake. Plus, an easy-to-clean design makes this perfect for me. Just rinse the Ninja, add in soap to the pitcher and whip for 3-5 seconds. There is no heavy base or glass bowl to deal with. I leave it out to air dry and it is ready for the next use. Now, moving onto the negatives, truth being told is not that bad. The entire setup can take up a sizable footprint. I don’t really need to make full use of three lids, three blades, and three carafes. I have used the chopper for dense vegetables like carrots, but it generally doesn’t get much use. A further minor niggle is the need to constantly hold the button while the motor is in action. But, this isn’t too much of an issue because of the sharpness of the blades and extremely powerful motor which means the ingredients are pulverized in 10-30 seconds. The Ninja Master Prep is effective, fast, and powerful. Just make certain the power unit is in the correct position before switching the appliance on and it should function for a long time. This appliance is really my best friend in the kitchen. The Ninja Master Prep blender has a List Price $49.99 and Best Price $34.85 (subject to change). This is well within the affordable price range and easily has enough power and performance to provide the daily smoothies and frozen drinks.